Fall colors, I love them. The crafting bug struck last weekend and I think I managed 7 cards in total not all of them fall but a few of them. This card is so simple but is so pretty. I used My Mind's Eye -Fall in Love, this designer paper had muted glitter pressed into the paper. 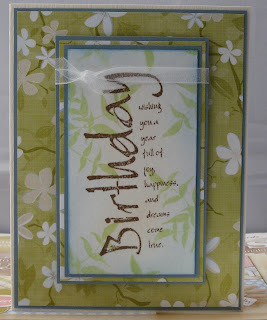 I used Cuttlebug die cuts to cut out 4 leaves, 2 brown and 2 of the designer paper. They are spaced with foam tape for a 2-D effect. I sponged the inside a spellbinders die then stamped the Autumn stamp. I finished with a small strip of ribbon topped with pearls. Supplies: Cream and brown cardstock, Designer paper-My Minds Eye-Fall in Love, Hero Arts-Autumn, Spellbinders-Labels 10, Cuttlebug leaf die cut, misc ribbon, Kaisercraft pearls. It was a beautiful sunny day today, the news was talking about a big storm for the West coast and I imagine it will roll in tonight but it sure was nice today though. I had thought we would have rain, and being as I had the day and empty house to myself I planned on some craft time. It was wonderful to put on the IPod with a book, brew a tea and just play with some paper and glue. I managed 5 cards, a couple of those Halloween and fall which I have been procrastinating about for weeks. This card was not one of them, but I can post it without fear the recipient will see. I do not recall where I found the Designer paper, it had overlaying glitter parts and does not take away the masculine quality of the card. Supplies: Cream and brown cardstock, Unknown designer paper, Inkadinkado-Birthday wishes, brown Offray ribbon, brown embellishment dots, Provo craft-2x2 Vintage die. Happy Sunday , yup I know I don’t usually post today but I have a roast in the oven, waiting for my boys to get home from soccer tryouts and I thought it would be a good time. Sometimes simple is best. 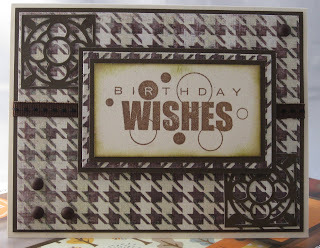 I love stamping, I rarely make cards that don’t have a stamp or two. My second love is beautiful touchy feely designer papers. I love the Glitter Book from My Minds Eye, the Fall in Love one.. oh yah I love it :). This is a simple cards because I really did not want to take away from the oh so pretty glitter paper. I wish this picture showed all the glittery goodness. I also found these Prima Pebbles at the local stamp store, and I found the script one perfect for this card. Supplies: Cream and brown cardstock, Designer Paper-My Minds Eye- Fall in love (glitter), Stampabilites-Thanks, Prima-Pebbles embellishment, Crystal Stickers-Glitter Domes(brown). Just a quick post. I tried a different type of card in honour of my sister Barb’s Birthday today. My sister has so much talent in everything art, her cards are amazing and always very unique. As hard as I try I can never get the same results as her, but who am I kidding I like my layers. So this try was for you sis. I don't work very well with mulberry paper, I always seem to tear it or glue it on wrong. I did not seem to have too much trouble this time around. I used a brown craft ink pad to color the little tulle tail. I stamped and embossed flourishes to jazz it up a little. Supplies: Cream and burnt orange cardstock, Designer Paper-cream mulberry, Inkadinkado-Dot Flourishes, Justrite-Happy Birthday, Craft Essentials-copper embossing Powder, Misc ribbon, tulle. Happy Birthday Barb, Love You. Autumn is sure in the air here, I don't know if it is the blast of rainy weather or the chilly morning temps but it just feels time. I will miss being able to run out the door without a coat and wearing flip flips but I am all primed for the fall colors, I think it is because I had such a fabulous summer this year. Anyhoo :) this is a pretty little Birthday card I made. I don't know what the designer paper is as I found it in my scrap pile. There are infinite treasures in my scrap piles :). Supplies: Cream and blie cardstock, Paper Inspirations-Birthday Joy Calligraphy, Memory Box Leafy Branch and Fern Print, unknown Designer paper, misc ribbon. Happy Tuesday. It was a rainy chilly day here yesterday, a perfect day for tea and cardmaking, I only managed to make two cards but they were two that I have been dancing around for a while-will post them later. Also on the agenda was spring(urmmm) fall cleaning, my sister Barb has that bug and was telling me all about it, apparantly it is a really infectious virus that can be caught through chat and email. 4 very large bags later I still have a couple of areas that need to 'sorted'. It did not help that I watched a few episodes of Hoarders either. Don't get me wrong I don't have a huge abundeance of overflowing items but it made me really think about some of the stuff I was keeping. This cleanup has also inspired me to dig a little deeper into craft supplies to find designer paper and whatnot, this said some of these items don't have names or orginal packages for me to add to my card recipe. Supplies: Cream and green cardstock, Designer Paper-Unknown,Inkadinkado-Flourished Fall Tree and Thank you, misc ribbon and gems. Happy Friday, and a long weekend to boot. I am so happy I have my card making mojo back, I have high hopes it will last a while. I sat down and managed two cards last night, I would have made more but I was tired and did not want to get sloppy. This is the last card of the little set of Simple Thank you cards. I spent more time on it *pause* :) I added a little glitter marker around the bull rush heads. Supplies: Stampin’ Up! 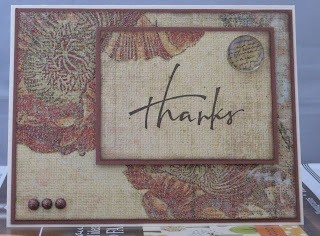 Naturals White cardstock, Inkadinkado A Special thanks to you, Sunshine Designs-Bull Rush, Stampin’ Up ink spots.